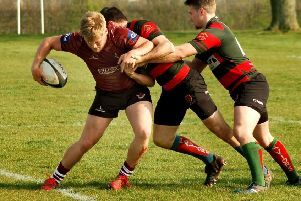 Melton RFC’s Burton Road home was a hive of junior rugby activity on Sunday as it hosted Leicestershire Rugby Union’s County Festival. The format of the festival was a number of round-robin, games with no final scores and an emphasis on fun and participation. More than 60 teams took part, travelling from all over the county with more than 2,000 people attending in total. In a feat of excellent organisation and co-ordination, Melton RFC’s die-hard volunteers and club officers put on a fantastic event which drew [praise from the county governing body. The club’s under 15s and under 12s gave up their own fixtures to ensure the day ran smoothly by helping to sell programmes and direct traffic. Melton’s senior section also pitched in, some even working into darkness on Saturday night to set up the pitches. “The day was a roaring success for the club, with many visitors commenting on the organisation,” said a club spokesman. * On the pitch, Melton RFC under 9s put on a faultless display at the festival. The first match in a festival can often be a shaky affair, but the team started as they meant to go on, focused, driven and hungry for tries. Boasting a mixture of skills and abilities, the coaches were able to field the best team depending on the opposition, with Parker-Allen captaining the team. Along with Jopling, he did a great job of directing a fast defensive line, resulting in lots of turnover ball by forcing the opposition into errors. The runners did their job well, with Rutherford fast and focused, Roberton incredibly strong and Ford nipping through the gaps. Keightley and Marriott held the key in the centre and ruled the area throughout the morning, while Marshall-Taylor was fearless, successfully tackling an opponent almost twice his size. Coach Jenny Beech said: “I honestly couldn’t be more proud of these kids. They have done everything we have asked of them and more. “They had it all today, good humour, good behaviour, fantastic skill and respect - one of our boys even told an opponent ‘mate, that was the best tackle ever’. The team are at home for the next two Sundays before the Hinckley Festival the following week.